Perversely, for the first time in a week I had an ensuite and I didn’t use it in the night. What a wasted opportunity. But it was so nice to be in a proper bed, that I slept right through (apart from a brief interlude when it sounded as though a duck was being strangled right outside my window). We made packed lunches today, using stale white bread that no-one was impressed with; but at least had breakfast in the hotel – where the juice on the buffet was labelled ‘Fresh Passion’. Always a good way to start the day. There was a TV on the wall showing a lecture by an economist, who was writing notes on a blackboard using chalk, which seemed a nice little contrast of media. Not far from the hotel was the border crossing to Rwanda, which was a straightforward matter of queuing and passport stamping – except with the extra requirement on the Rwanda side that we had to present our bags for inspection, to make sure we weren’t carrying any plastic bags. They banned plastic carriers 30 years ago – a stunningly forward-thinking move that puts the rest of the world to shame – and some were indeed found amongst our group, despite earlier warnings (not me, natch). Then we set off for Kigali, Rwanda’s capital city. En route there were green terraced hills – Rwanda is ‘The country of 1000 hills’ – and miles of tea plantations dotted with villages where children waved enthusiastically at the truck and their parents were in neat Sunday best: especially tall elegant women in colourful gowns and matching headscarfs. So far Rwanda seems more orderly than Uganda: motorbike helmets compulsory, the road better made and edged, proper pavements. 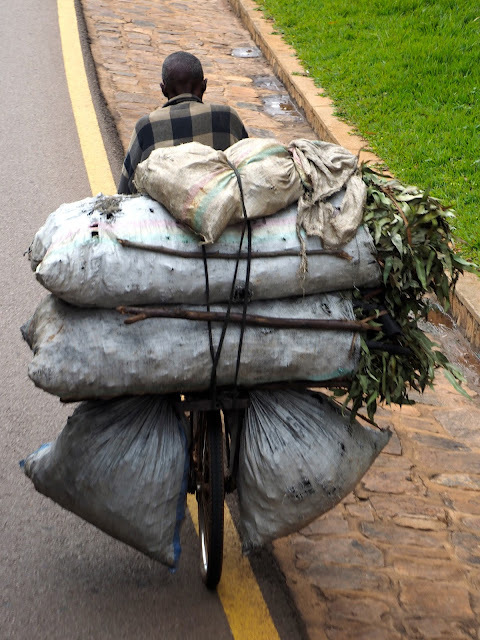 The bicycle seems the preferred (possibly only affordable) mode of transport, for carrying people, milk, firewood, all sorts – so fast down the hills that the truck was sometimes unable to overtake. Then we got to the Kigali Genocide Memorial, which was a professionally-presented record of the before, during and after of the 1994 genocide that for so long was just a brief item in the international news. Up close and personal, it was stunningly horrific, and the exhibition pulls no punches. It’s controlled, but passionate, and the many personal testimonies, in writing and on video, are confronting and desperately sad. There was a separate room for an overview of some other genocides (“note enough room for them all”) including Armenia, Serbia, Cambodia and of course the Holocaust – to the presumed resignation of the German tourists going through with us. We arrived at our accommodation for the next three nights: a neat hotel/hostel/campsite where we will be in dormitories for a change. There was a walk around the town visiting a variety of ATMs, with a variety of success, and a quick look at the market which seems worth another visit. The pavements were busy with, amongst others, beautifully dressed guests on their way to a reception, curious kids, and chatty young men keen to extract our email addresses. The younger generations speak English: it's been the language of instruction since 2007 when it was changed from French to fit in with the other East African countries. The older folk do still speak French, though, which is fun to hear. Then it rained, hard, and we ended the day as usual, with beer, a briefing and dinner (meatballs tonight) - and all fingers crossed for fine weather and a gorilla trek tomorrow.